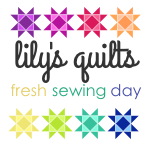 Whether you’re joining me from Fresh Sewing Day at Lily’s Quilts or from Sunday Stash at Molli Sparkles, I have something for you today. As far as my stash scene goes, dear Sunday Stash readers, I’ve been living a lie. I had convinced myself that I was a smart fabric buyer, that I buy sensible yardage to stash and that other fabric purchases are for specific projects. 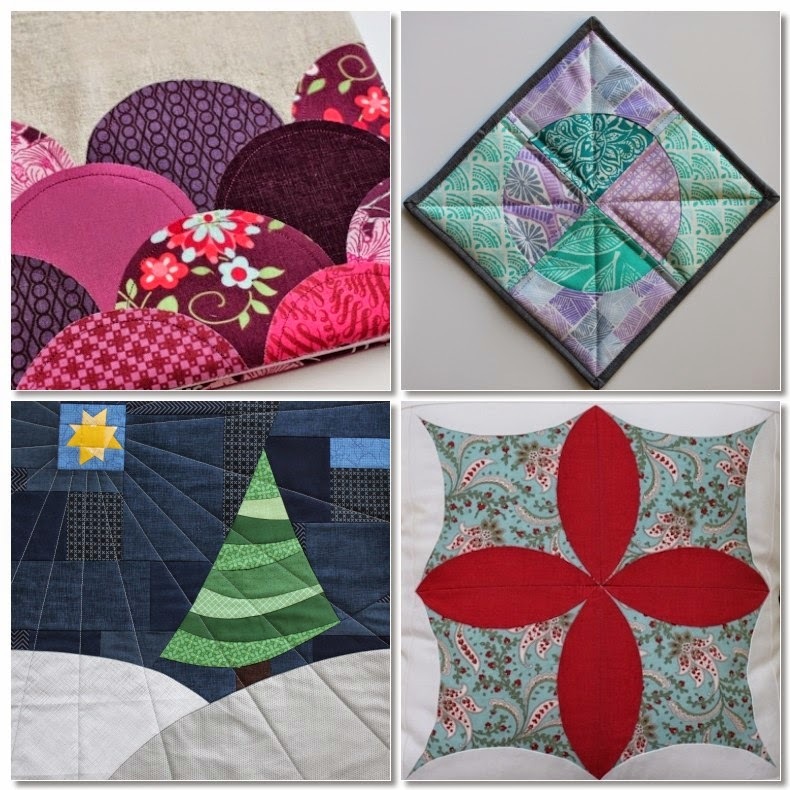 The truth is, I cannot resist quality quilting cotton at good prices, especially when that quilting cotton comes from one of my favorite designers. Exhibit A: a jellyroll of Denyse Schmidt’s Florence line, bought on sale at the Fat Quarter Shop. 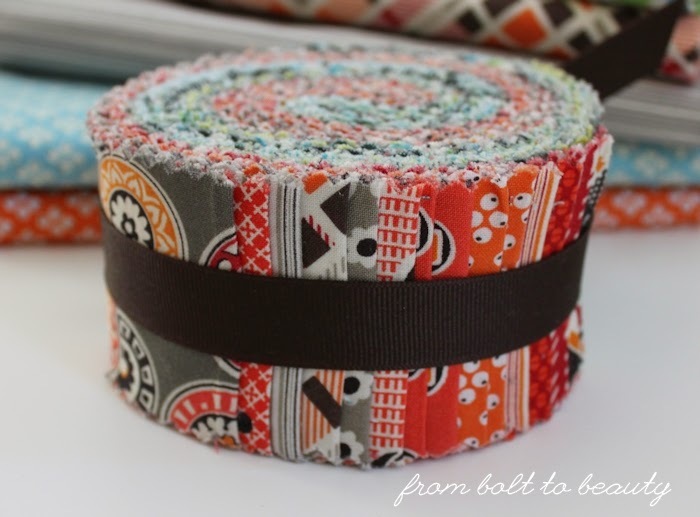 I confess: I bought this jellyroll for a guild swap, but I liked it so much that I kept it for myself and bought something different for the swap. (The shame!) Although this jellyroll is on the small side, it contains both colorways for the line: blue and orange. I have this thing for red, green, and blue. They’re my default color palette. I prefer a red close to cranberry, a green with a big dose of gray, and a pale blue that lately has been bordering on aqua. Maybe this phenomenon isn’t unusual. Perhaps you have a set of colors you consistently prefer over others. Here’s where the weirdness starts: My mom also likes red, green, and blue. Her house is decorated in a dusty pink, greens on the continuum of sage to sea foam, and Williamsburg blue. And now it gets weirder. My 6-year-old likes the same three colors. When he was just 18 months old and faced with a pile of colored blocks, he would separate the red, green, and blue blocks from the others. In fact, we found collections of all sorts of red, green, and blue objects squirreled away around our house. He so consistently preferred those colors that I made the cupcakes for his second birthday with layers of red, green, and blue batter. My stash reflects my fondness for this color palette. 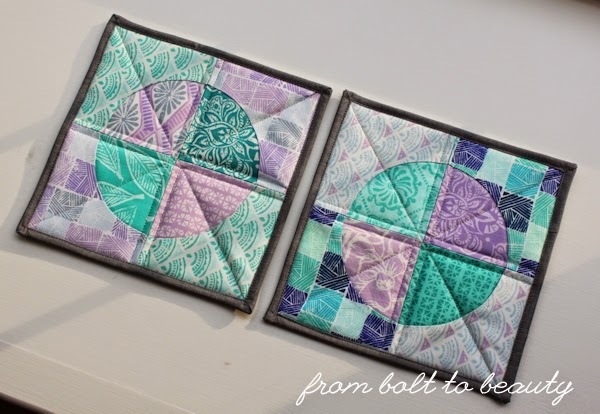 I’ve had one special fat quarter stashed away for many years, waiting for the right project. It’s an old print from Maison de Noel by 3 Sisters, and it appeals to my more traditional side. 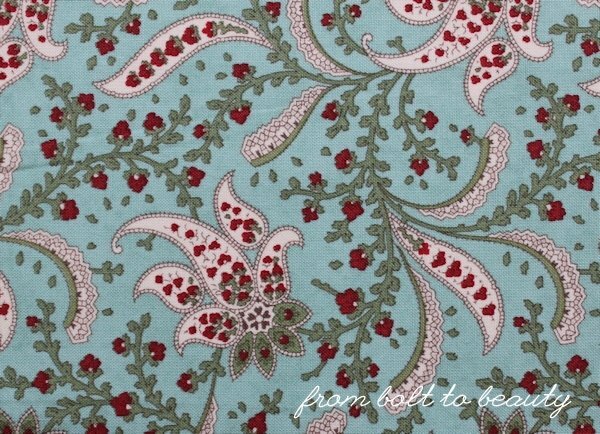 It’s a sweet paisley, but I know I likely wouldn’t have bought it in a different colorway. If I had to summarize this project in a single word, it would be fiddly. With this Curves Class assignment moreso than the others I’ve finished (including this journal, this mini, and these potholders), I unpicked seams and at times scrapped an entire quadrant to start afresh with newly cut fabric. Despite the failed attempts, I’m happy with the results, and it’s satisfying to step by and bask in the glow of a few nicely pieced curves. I like squares, rectangles, and triangles well enough, but the softness of these curves makes me want to sew more of them. I paired 3 Sister’s Maison de Noel with Kona Snow and this off-red from French General. 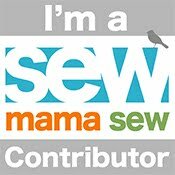 I didn’t think quilting—or maybe my quilting? 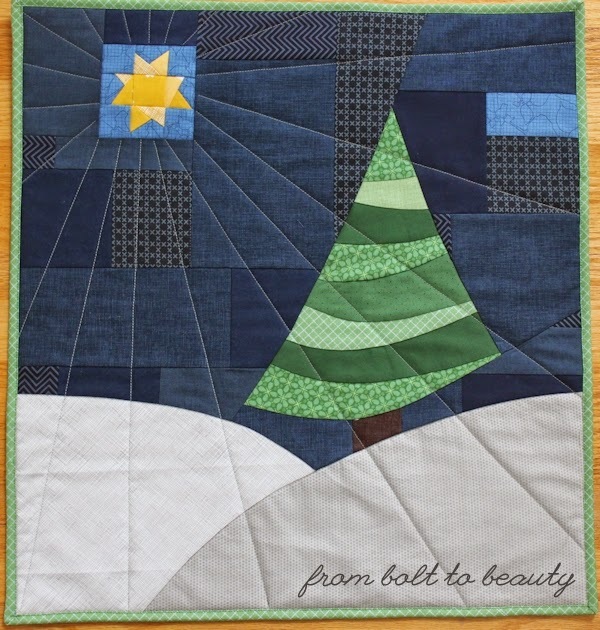 !—would have added to this piece; I liked the clean look of the curves without quilting lines. To add substance without adding batting, I chose to interface it with Pellon Thermolam, which seemed to work well. Curves classmates: I have one thought if you plan to sew this project. Do you remember Rachel’s original? (My apologies to other readers! I can’t find a public pic of Rachel’s pillow!) She cut all four main template pieces from a single square of fabric with a large-scale design. The result is amazing, but I chose a more forgiving nondirectional fabric. I actually made six quadrants and scrapped two wonky ones, but since I used a nondirectional, it didn’t matter which of the six I used in my final pillow. I have two more projects for this Curves Class: my rainbow color wheel, which needs to be quilted and bound, and my Oodalolly (see Rachel’s original here), which is currently a heap of fabric. Stay tuned in the coming weeks for more on these projects. Before I sign off, I wanted to send a shout-out to my fellow Curves classmate and all-around favorite quilty person. 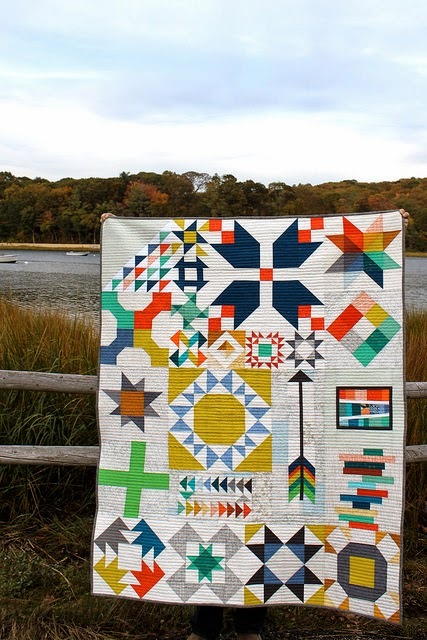 Kim Soper, the talented lady behind Leland Ave Studios, was not at QuiltCon last week, but her Long Island Modern Sampler was—and it won first place in the modern traditional category. 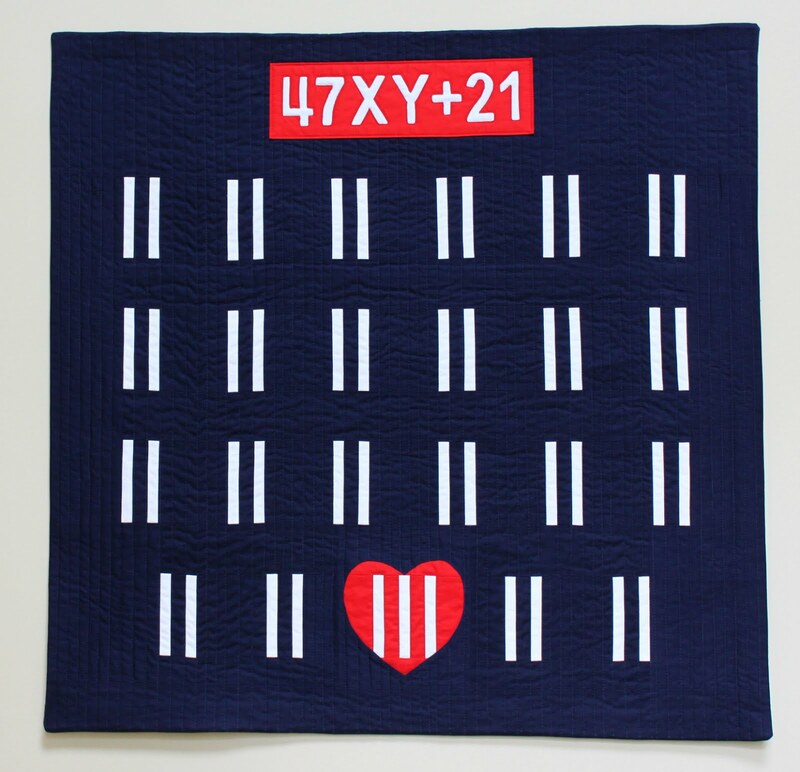 To read more about this quilt and to learn where you can find the patterns for the individual blocks in it, visit Kim’s blog post on the subject. 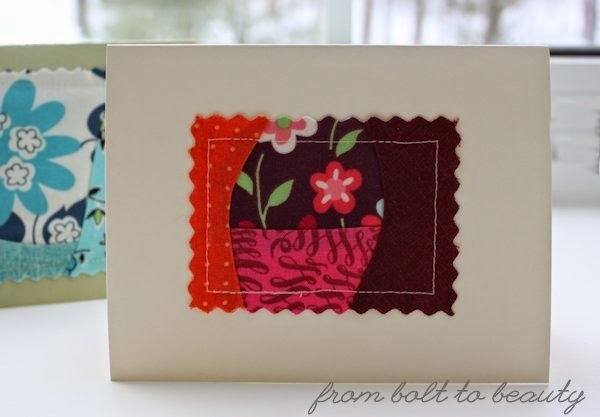 Hello, readers—both regular visitors and newcomers from Scraptastic Tuesday. Scraps are like laundry: As soon as you get them under control, there’s a new pile to deal with. And like laundry, my scrap-busting efforts are ongoing. The more imminent project, however, is my first color wheel. 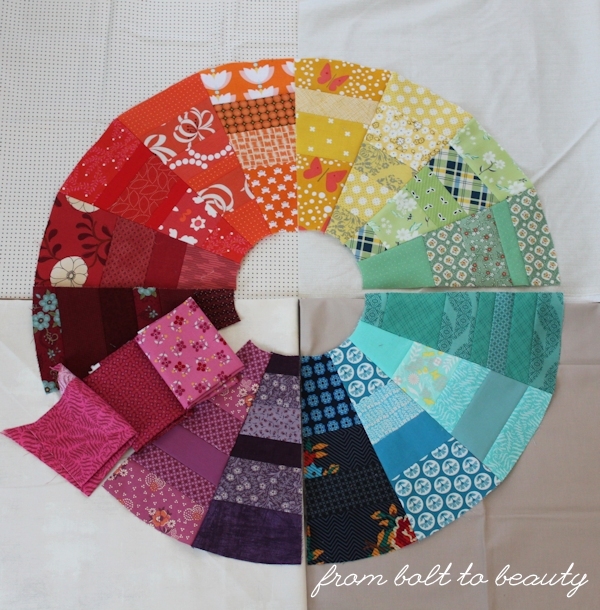 Originally blogged about here, this quilt is an assignment for the Curves Class I’m enrolled in. I started piecing before the class began and had to put it down for a month to work on other quilts. That time apart did me and this quilt some good. I was able to consider the color transitions with fresh eyes and, taking the good advice I received from readers to heart, made some changes. I added an orangey-yellow wedge, edited out a blue tribute to Denyse Schmidt and Carolyn Friedlander (sadness! ), and reworked my pink wedge. I’m feeling good about these colors and this layout and all the scraps I’ve used. 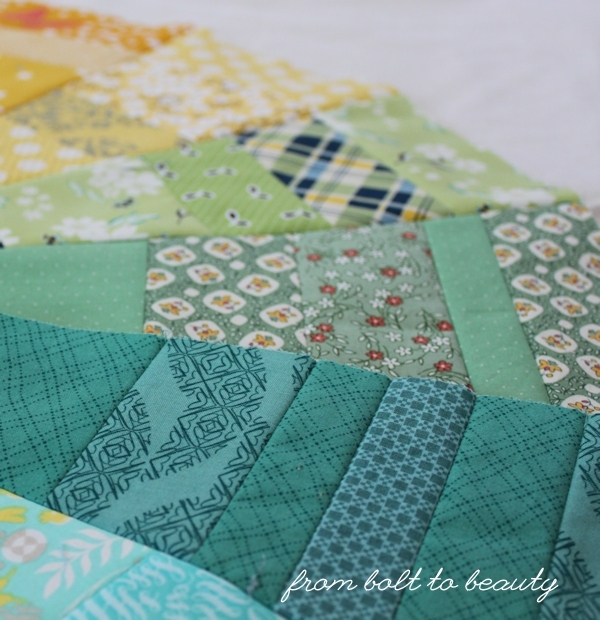 It’s time to sew these slices together and finish this quilt up! 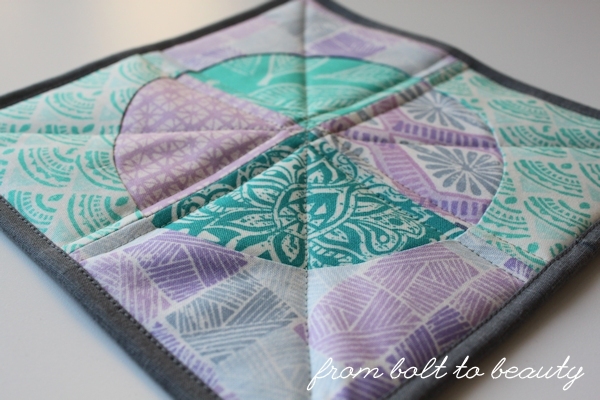 My last snippets of Denyse Schmidt’s Chicopee line are in the teal wedge. compose the new orangey-yellow wedge. I make it sound easy, but I suspect that I’ll be making some last-minute changes here—it’s not the wedges, but the overall size. A 40” x 40” quilt seems big for a wall hanging. (What do you think?) I may end up enlarging this project and make it a full-size quilt. Because that’s just what I need, right? 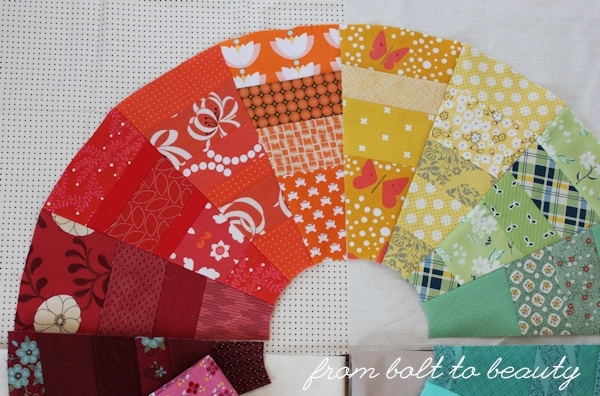 A full-blown quilt project to quilt and bind. 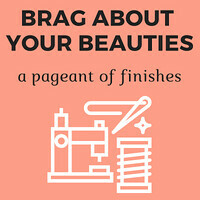 I am really excited to see this come together and hope to reveal a finish by the end of the month! Miscuts, Scorch Marks, Kate Spain, Etc. 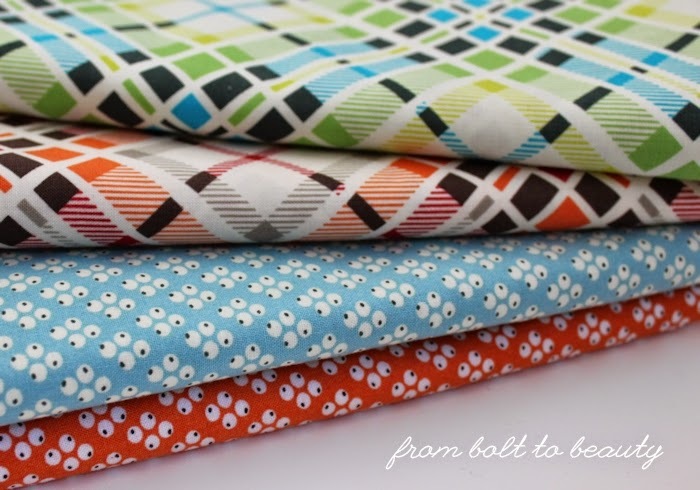 A funny thing happened the last time I was at the Fat Quarter Shop: I bought a charm pack of Kate Spain’s Horizon line. I’m pretty sure it was my first time buying her fabric and it is colorful stuff. I chose it in part because I have a touch of cabin fever and would rather be somewhere warm and tropical, dressed in these shades of cobalt, turquoise, green, and lavender. Sigh. I quickly put these charms to use in one of the projects for Rachel Hauser’s Curves Class. Operation: conquer the drunkard’s path (DP) quilt block. Rachel’s method of constructing the DP involves oversizing the pieces and, as she says, “trimming to perfection.” She’s my kind of sewist. The curves themselves didn’t present too many problems. The fact that I didn’t sew right sides together at one point and miscut the fabric at another did. Then there was the incident of the scorched blocks, but I really don’t want to talk about that right now. For my Curves classmates and anyone else who’s interested in the nitty-gritty of the DP: I sewed without pins. (Remember: there was enough play to trim the finished pieces of the block.) I tried starching before cutting and before sewing, and I didn’t see much of a difference—except for the scorch marks. I attempted to cut more than one charm at a time, and it didn’t work. I press pretty hard on my rotary cutter to main control of it when I cut without a ruler. That worked fine with one layer of fabric. Anything more than that would bunch up, resulting in inaccurately cut pieces. As for the sewing itself, I’m going very slowly, using a short stitch length, and stopping with my needle down to pivot occasionally. 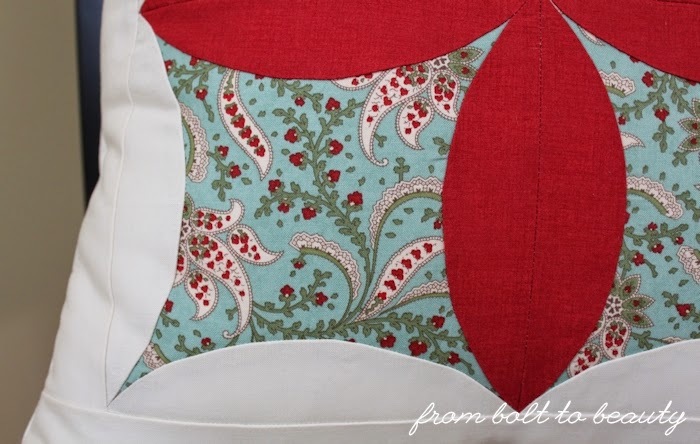 I’m pleased with my results thus far: one potholder in Kate Spain fabrics. (There were supposed to be three. See the aforementioned sewing snafus to figure out what happened to potholders 2 and 3.) two potholders in Kate Spain fabrics. UPDATE: I couldn’t fix the miscut block, but I was able to salvage the one that was scorched. You can barely seen the problematic spot; that’s good enough for me. Huzzah! Next up: Rachel’s Orange Peel Pillow. It contains 16 orange peels—that’s 16 curves to sew. I think I just may be able to do it. Step 1: Pick your fabric already, Michelle! The snow will not stop in New England. I’ve long lost count of how much has accumulated. Let’s just say we stopped measuring in inches weeks ago. The latest finish to emerge from these hours at home is my Oh Christmas Tree wall hanging for the Curves Class I’ve been taking. I love it! 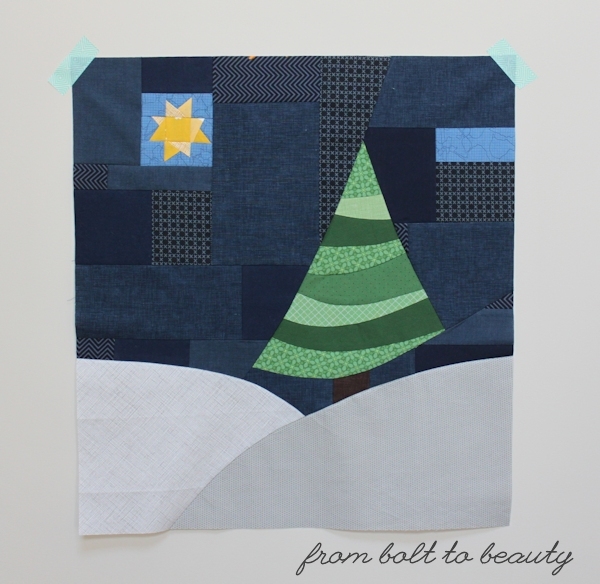 I love this quilt’s navy sky and snowy gray hills. I love the greens in the tree, most of which are new to my stash. 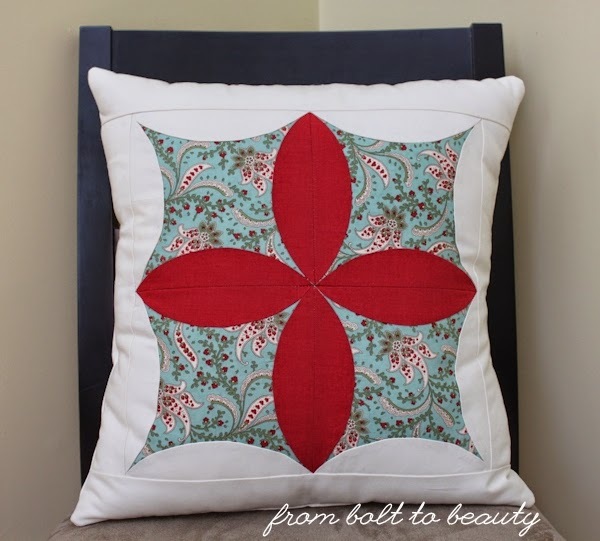 I love the light blue Botanics fabric that serves as background to the star. But most of all, I love that I sewed this all on my new machine, a Janome 1600P-QC, and that I actually quilted a project to completion. My quilting confidence had been running low. My last sizable finish—back in October!—caused me woe. Recent forays into FMQ were not successful. These events did a number on my psyche, but I’m going to take this win and run with it! I still have two more weeks of instruction for Curves and then a few weeks to wrap up Curves-related projects. In other words, prepare yourself for more talk of curvy piecing. If all this talk of curves piques your interest, you can still sign up for the Stitched in Color class. 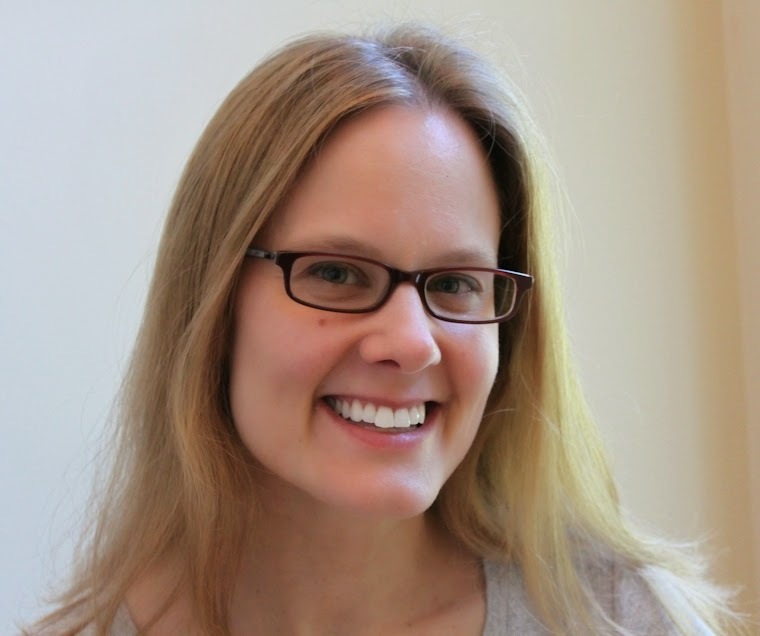 Although formal instruction ends in two weeks, the class blog is available through March 19, and the premium version includes an ebook, so you can piece your curves at your leisure. 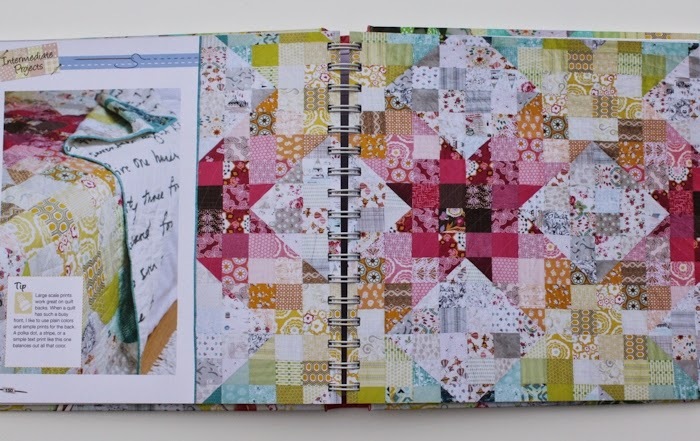 Another alternative is Angela Pingel’s book A Quilter’s Mixology. She recently released a companion DVD as well. I haven’t gotten my hands on either yet. If you have, I’d love to hear your take, especially if you’re familiar with the Stitched in Color class on curves. Oh, I mentioned this before, but the dot-laden fabrics in Oh Christmas Tree are my take on the latest theme from Le Challenge! 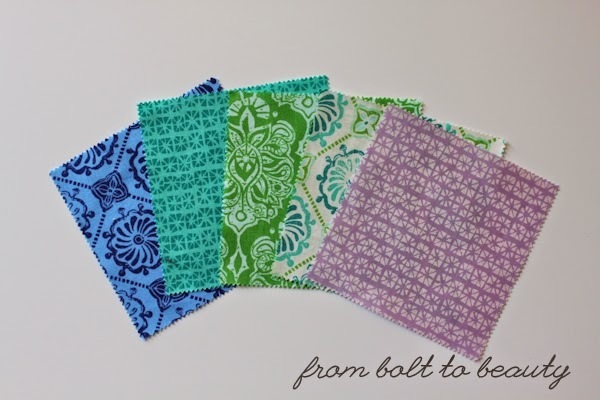 Dear reader, in my opinion, the past few months of posts here on From Bolt to Beauty have been reporting more on my tribulations at my sewing machine and my growing neurosis about quilting than on my sewing triumphs. Well, do I have a post for you today. It chronicles how I faced a challenge, tackled a few firsts, and kicked some curve. So you’ve read that I’m taking Stitched in Color’s Curves Class. Last week, I eased my way into the world of curves with a clam shell journal cover. Since then, I delved into improvisational curves. 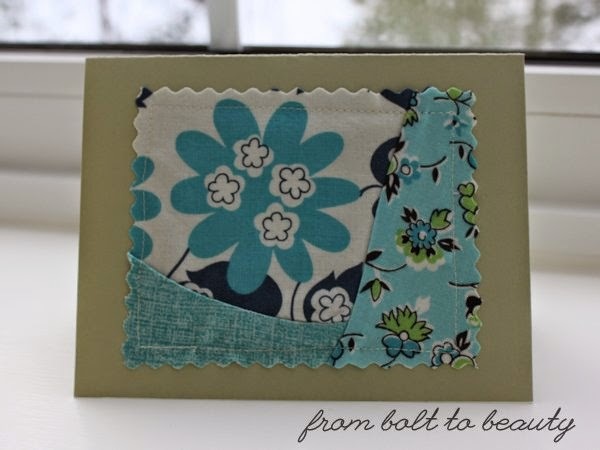 It started with one note card, using lovely scraps that were so small I would have otherwise tossed them. Then there were two cards. I think I made eight or nine cards in total. 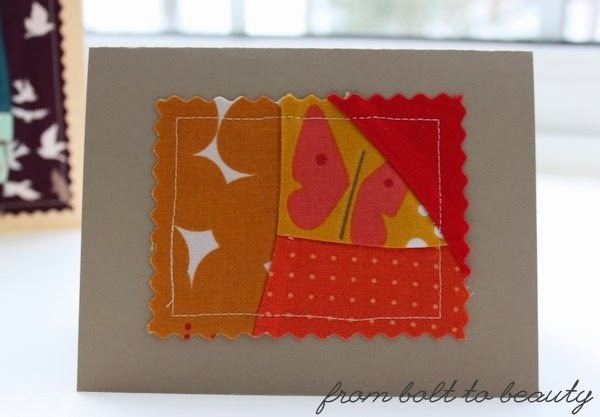 There was just one casualty: a card I sewed shut. Arg! I enjoyed the card-making process a lot, but it was time to move on to the next assignment: Oh Christmas Tree. This was a higher-stakes project. It took more time, and I really, really liked the design. I didn’t want to blow this project. I’ve done little improvisational sewing—this was by far the largest piece I’ve done—but I took my time with the curves and I’m pleased with the results. Did you notice the dots on the tree and one hill? To recap, these projects were my first substantial foray into improvisational sewing and included my first wonky star. 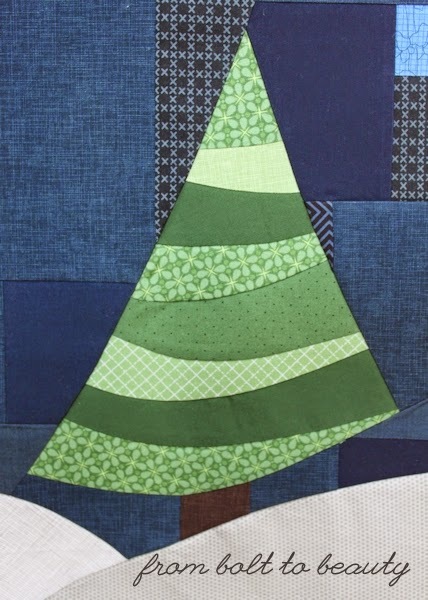 Oh Christmas Tree was also my first project sewn entirely on my new machine, a Janome 1600P-QC. It is too early to pass judgment on this machine, but once I saw how easily and evenly she sewed through the side seams on a Sew Together Bag without a walking foot, I knew I needed to get comfortable with her, and fast.